Image: Parks are a saving grace for many families during the summer, when school is out. This is the best one I could find on the web of Timbertown, which is at my son's favorite park. We'll go there more than a few times this summer! There are a lot of hidey holes in this structure, which my son with autism seems to really like. Image: This least favorite park has some wide open spaces that encourages both structured and unstructured play. My oldest really does like to blow bubbles, but I don't think he would blow bubbles for more than an hour straight like my little one did. At times, C2, pictured above, would be surrounded by children popping his bubbles. He thought it was great fun. Image: This is the second favorite park in town that we usually only visit when their dad can come with us. This park has trails, from which the river can be accessed (some safety concerns here). It features some of the the most beautiful scenery in town, but it only has a small play structure at the trail head. We are currently transitioning from a school to home schedule now that school has let out for the summer. Out of the four of us in my family, guess who is having the hardest time adjusting? Ok, I'll make it easy for you. It's me. I'm a stay at home mom that got a little used to having extra free time to finish up projects, etc. while both boys were in school. The new schedule doesn't affect my husband much since he works during the day and the two boys are pleased about being able to stay home all day during the summer. We have a basic routine for morning and evenings, but afternoons are wide open. In the past this time of day has dragged by for me. I'm most likely to have a conflict with my son during this time of day. Although it's not always possible, it helps to schedule an activity like going to the park. I think my son needs the stimulation that going outside or to a different indoor location provides. The trick is to go somewhere where he doesn't get a sensory overload. We also have to work around some of his other quirks. For example, the three of us can only go to one of the three parks because that is where my guy behaves the best. A visit to one park nearly always leads to meltdowns. The meltdowns at that park haven't been due to sensory difficulties rather than a matter of his expectations. 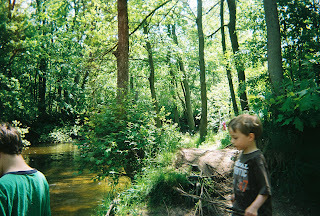 There isn't a whole lot to do there, and he likes to take his shoes off and wade in the river. This isn't always feasible. The favorite park has a humongous play structure with quiet places to hide if desired. There is also a slide park nearby with seven or eight different slides to go down. I can usually take both boys there by myself with little difficulty. On Aug 11, a spray park will open at the favorite park. My town doesn't have a swim pool, so I'm hoping this will be a welcome addition rather than "an attractive nuisance" that inspires behavior issues... We'll see. If my husband is with us we can go to the second favorite park. This one has a lot of trails, some of which run right along the Chippewa River. So with two boys it's easier to have dad. I've tried going to this park with other adults, but my son tends to listen to his dad (who also has a calming effect on our boy) best. Max's place, a summer arts day camp for children with Asperger Syndrome or mild autism, has been cancelled this year, so there are two more weeks to fill than we had the last two years. Our options in my hometown are a little bit limited, but we'll manage somehow. In Michigan there is a state law that requires schools to open after Labor Day, which falls on Monday September 7 this year. (This law was passed to encourage tourism in our upper peninusla). We have three vacations planned and my guy will go to a summer camp for special needs kids for one week. So minus the camp, the vacations, weekends, and one planned outing, I have approximately 40 afternoons (from today, June 12)to muddle through. Hopefully we'll have more good days than not. Yes i hope you have more good days than not. I cant quite imagine summer holidays being that long. I thought our 6 week summer hols here in the Uk were long enough. Structured days are best. Over the years i built up really good routines that worked well for us. Favorite park 2 sounds cool. Which one is it? If you ever want to converse with another adult while you boys play at a park, I wouldn't mind going along. I like the outdoors and I have far too much time and far too few acquaintances.